Last year I realized how much I love to create, and I won't ever stop. Last year my friend Raquel Cruz wrote the first guest blog post on my site. 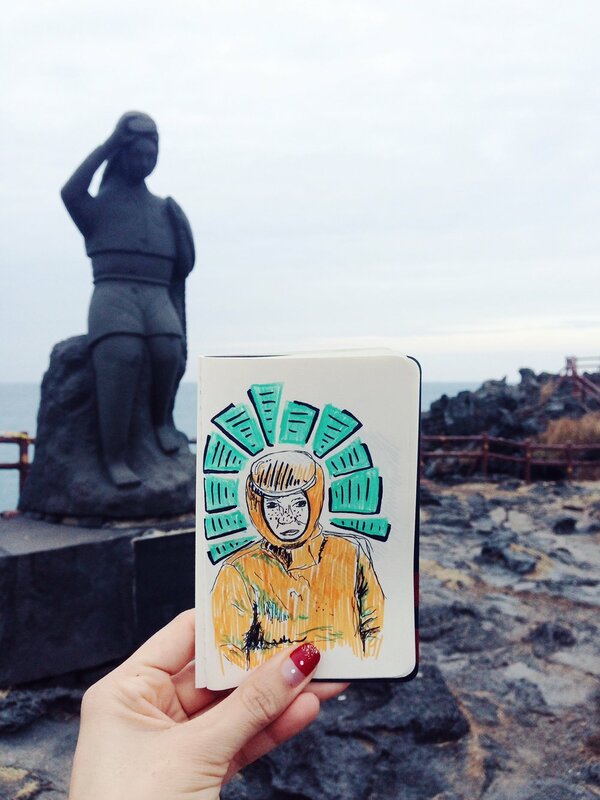 She is an artist and teacher in Soeul, Korea and she shared about how she captures moments of her travels through a sketchbook instead of taking photographs. I love the sketches she's made, not too detailed, yet full of life and color. They make me see the world through her eyes. If you missed that post, you should read it after this one. Image courtesy of Raquel Cruz. I think of a creative person as someone who finds a source of inspiration and makes something out of it. What if your passion was to make sculptures out of rocks? (Taken at Rio Tejo in Portugal). For the sake of this blog, I don't want to limit the word "creative person" to someone who works within the arts. While most guest posts will come from people who are in that environment I'm hoping that others who have created businesses, etc. become a part of this. I don’t think the word creative should be a word that only describes artists. I think it is a quality that can come more naturally to others, but I think we are all born with some sort of creativity. Creativity is the reason why a 5-year-old can make blobs on paper and imagine a foreign planet. It's the reason amazing chefs make mouth watering dishes, creativity is the reason a girl in Shanghai went to study biomolecular science in Nashville, TN (she wants to find the cure for cancer). Creativity is the reason an engineer can build a bridge or the Wright Brothers made a flying device, or Steve Jobs made the iPhone. To start there will be musicians, writers, photographers, artists etc. but I'm curious to see what the year brings. As I listened to friend talk about the story behind her music about 8 months ago, I was deeply inspired to figure out what I wanted to share through art. Not only did the words to her songs speak to me in the season I was in, but looking back it was around that time that I started a journey to find my voice and to create what made me excited or challenged me. Someone else's creative journey challenged me. 8 months later, including a big move from the city that had been home for 3 years, a trip to Europe, I have a painting collection with a story, it's my story that I hope resonates and inspires others. That's why I'm asking other friends to share, if I was inspired by their stories then I hope you are too. The goal is to have a weekly guest blog where someone different shares about what they are creating and why. I want this website to be a resource, a source of inspiration for others. I'm hoping that people from all around the world can join this initiative, as I think cultural context greatly influences what people create. I believe in learning from the differences that make us unique. For instance, I love the way Asian artists have used ink to create bold marks in their work, and I love the simplicity and minimalism in their interior design. I also love the grungy street murals that I saw in Lisbon, or the fact that people who live in the Caribbean have carried the cultural heritage from Africa and their dancing is awesome. I believe creativity is a gift God gave us to connect with His heart, to understand Him a little better and in turn for us as humans to worship Him when we discover his beauty and grandeur. Whether you believe in God or not, I think He gave us creativity so we could deal with a broken life, I think he gave it to us to inspire others, I think He gave us creativity because as his creation it was something He wanted to make innate in us. I'm excited to share and learn from other amazing people, I hope you are too. As I finish a day of work, my background is a silent view of the city. I've got my headphones in, so I can't hear the hustle and bustle of the cars in the street in front of me. In the far back, I see mountains (maybe hills for some who live in places like Ft. Collins, Colorado) and wind turbines that decorate my city. On one of the mountains I see a line of trees at the top...it stops...then continues...The city is in the middle, all I see are white little houses and the occasional pinks, blues and orange tones. Twenty feet in front of me is tall grass, swaying back and forth almost as if it can hear what I hear. The sun is setting, the grass is shining. A big blue expanse to cover the entire scene, today there is only one cloud on the far right. Breathe, I take it all in. quick sketch. remembering a moment. My view is spectacular. I chose not to take a picture of it. I saved it in my memories and then decided to do a really quick sketch, so I wouldn't forget the moment. Beyond those mountains is a world that awaits to be discovered, behind those mountains is the promise of a big adventure. I wonder about all my friends from around the world and what they might be doing, I wonder when it will be time to explore once more. But today I'm ok with just sitting behind my computer and letting my mountains inspire me.